悟 (wù) means recognition, realization and comprehension. 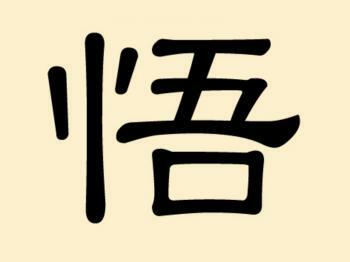 This character was derived from the symbols 覺 (jué) and寤 (wù), which both mean ‘awakening’ or ‘awareness’. Awakening in this context corresponds to the idea of waking up from sleep. For Chinese this meant attaining enlightenment and deep insight into the universe, thought to be similar awakening from a dream in Taoist thought. Recognition was seen as coming from within. Therefore, according to Chinese belief, this is the same as coming from the heart 心 (xīn). According to the Chinese belief, mere mortals view the world in a distorted form, because every sentient being has a different point of view of the environment in which he or she lives. 悟 allows man to gain a deeper understanding of the objective truth of the universe, providing the opportunity to awaken from ignorance. Therefore, this symbol is generally used in a religious context. The above character derives its significance from traditional religion of historic China. They taught that major Buddhist and Taoist philosophies exist according to cosmic principles, and teach that man must strive to adhere to such principles to ‘achieve perfection’. Internal cultivation, that is, cultivating ones heart to be good, was viewed as a lifelong process which depends on 悟. Only by acknowledging this could people correct their limited notions and shortcomings, and improve the morality of the heart. A human's understanding or comprehension on their path depends on themselves, and cannot be taught through external methods.